Stamp a Little Love Baby! : Paper Piecing is FUN! Hey everyone! Today was another Hanna Stamp Challenge. You can check the member forums at SCS and play along each Friday. Or, play along over the weekend or week... just come and play, it's fun! Today's challenge was masking. Okay, so I didn't do any masking with other stamps, but I did mask before I got out my Copic Airbrush for the background. I had quite a few emails asking about paper piecing so I thought I'd show ya real quick. It's fun and it adds dimension and fun to your cards. Are you ready? Paper Piecing 101. 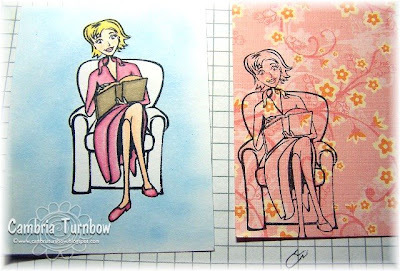 Step One: Stamp your image on the card stock that you will use as the focal point. color in the portion that you will not paper piece. Do any masking or other coloring. Stamp your image again on to your designer paper. Cut out the portion that you want to piece into your main image. Glue your pieces onto the main image. I use the Quickie Glue Pen because you can get the glue in tight spots and only where you want it. Hope that makes sense. I know having a visual sometimes makes it tons easier. I hope you'll give it a try! Paper: Georgia Pacific White, Regal Rose, Chocolate Chip, Chatterbox Rosey Villa Vines. Ink: Memento Tuxedo Black, Copic Markers. Other: Nesties, Cuttlebug, Dimensionals, Eclipse Masking Tape, Sakura Glaze & Glitter Pens, Heidi Swapp Pink & Brown Brads, Copic Airbrush System, Scor-Pal. 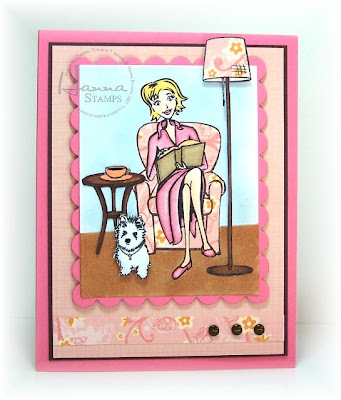 Love the card :) I also love the paper piecing. It's so much fun with all the different patterned papers! Great job on the tutorial Cammie. Thanks.. the visual helps us directiono impaired gals..
Wow, what a cool card. TFS. HI (again) Cammi!! You inspired me to get paper piecing today--LOVE IT!! Thanks again for sharing it with us. OMG!!! You are THE QUEEN I'm tellin' ya!!!! This is so AMAZING girlie!!!! I love it!!! Wow!! What great paper piecing. I can't ever get mine that straight! Thanks for sharing!! WooHoo! Thank you, Cambria for the tutorial. Now I'll have try it out for myself. Great tutorial and awesome card! Thanks for sharing! LOVE this card! 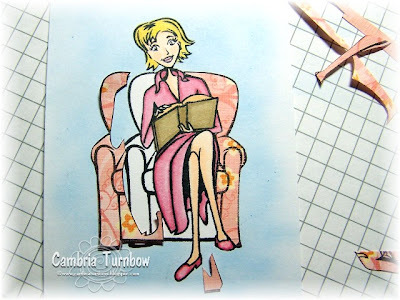 Paper piecing is so cool - and you do it SO WELL!! I love your paper piecing on this one! New Riley's in DA House!! DD/DDA June Challenge- Inside & Out!